Recently, one of our sisters had some serious surgery. While she was in the hospital, she had a powerful God experience. I wanted to share part of it with you and pray that in some way it will lead you to reflection about your everyday life and the Eucharist. This morning, after breakfast, I watched Mass for Corpus Christi on my smartphone. As Mass ended, the nurse came in to help me get showered and dressed for the day. 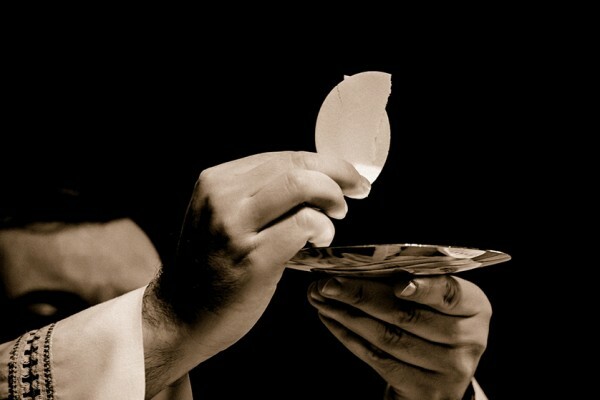 As I came out of the shower, a Eucharistic minister was at my door to give me communion. It was perfect timing. The Eucharistic minister chatted with me for a while, then proceeded to read the Gospel. As she was finishing the Gospel, "This is my Body…,” I was momentarily distracted by a sudden pungent odor filling the room. It’s a daily reality in a hospital, yet in that moment, it was Jesus who came in the midst of the stench. Deeply moved, the prayer continued: “This is the Lamb of God who takes away the sins of the world…” This is the Lamb of God who comes into the “stink” of our existence at our most desperate and often into our least expected moments and stands before us, offering life, light and grace -- a fragrant aroma. This momentary encounter with the Real Presence of Jesus will not soon fade from my memory as His tremendous grace and mercy daily pour out before me. How hard is it to recognize God in the 'stink of our existence' and praise Him for His life, light, grace and fragrant aroma? Be on the lookout for your God moments this week.